Buyers and renters love beautiful kitchens. It is one of the main rooms in the house that they want to have updated and renovated. Refurbishing old cabinets and countertops is a prime way for real estate investors to get a higher sale price for a home. The trouble is, it’s easy to spend more than they get back. To avoid putting your remodel underwater, save money on cabinets and countertops by using the easy DIY tips below. This may sound like a no-brainer, but shopping around is a shockingly effective way to save money when refurbishing cabinets and countertops. Painting prices can vary from $2,000 to $8,000 depending on the contractor. Marble can cost between $15 and $90 per foot depending on your choice of supplier. Save big money by spending a little more time digging for each material and vendor before you buy. Even when we shop around to save money on cabinets and countertops, most of us take short cuts. How many times have you fallen back on the conventional wisdom that the bigger guy will always have the lower price? Give local cabinetmakers a chance. They’ll often surprise you with the more affordable prices. It’s true that open shelving means more maintenance (think: dusting) but it’s often an attractive option and it’s definitely cheaper. A kitchen remodel that foregoes doors on even a few cabinets can save thousands. Decorative legs, crown molding, and other details can quickly add a lot of cost when refurbishing cabinets and countertops. To save money, splurge on one or two add-ons and skip the rest. Do you really need a marble countertop or will concrete do the job? Other affordable options for countertops are granite tile, faux stone kits, butcher’s block, and laminate. Consider remnants for small jobs. For cabinets, go with oak instead of hickory, maple, or cherry. Really looking to save money on cabinets and countertops? Choose an inexpensive laminate. 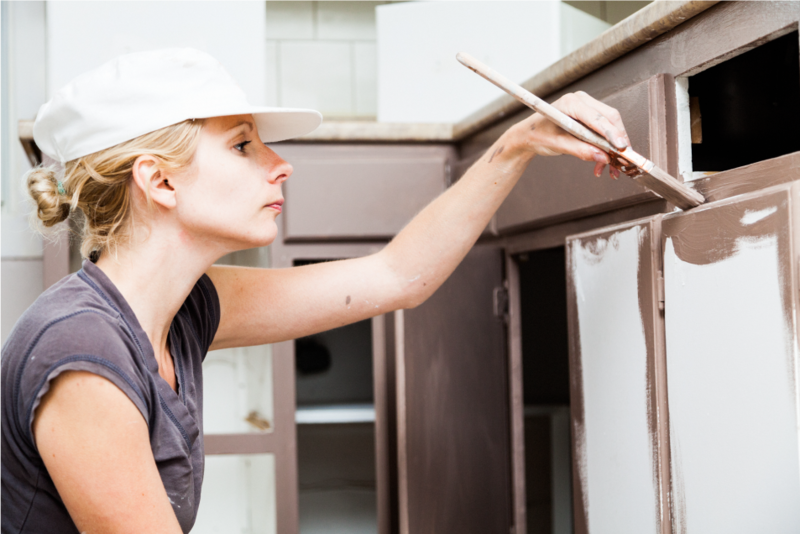 One way to save big money on cabinets and countertops involves our trusty paint brush. A fresh coat of paint can rejuvenate cabinets that look ready for the scrap heap. Before you toss that countertop, ask yourself if refinishing it might do the trick. As demo jobs go, removing cabinets and countertops is relatively easy. As long as you’re competent enough to avoid damaging the plumbing or electrical, DIY demo is a great way to save money when refurbishing. We know, putting together IKEA cabinets can be a frustrating experience. But when it saves thousands on a job, we can stand a little teeth-gnashing. IKEA’s prefab cabinets are beautiful and surprisingly low-priced. Afraid of installing your own lighting? Don’t be. You can find dozens of DIY lighting projects on the internet to help save money on your kitchen remodel. Tile backsplashes are gorgeous. They also bump up costs significantly. A sheet backsplash can be a beautiful choice that saves a lot of money on your kitchen. Consider thermoplastic, sheet metal, inexpensive slate, or even glass. For investors looking to fix and flip their next property, LendingOne can cover up to 100% of Rehab Costs. Our 12-Month Interest Only Fix and Flip Loans are a great asset for investors to have when looking to make that next purchase and renovation on an investment property. Apply today and learn more.